Braille was invented by Louis Braille (1809-1852) who became blind as a young child. As a teenager he developed braille notation for the blind who can read it with their fingers. Each braillecel is formed from a combination of 6 possible dots. These dots are numbered top down and left to right. The letter k is thus formed by dots 1 and 3. Because in braille we only have 64 different signs, all these signs have several meanings. The meaning is determined by the context. Below you find all 64 signs in Standard Braille Order. The first 10 signs not only refer to the first 10 letters of the alfabet, but also to the 10 numerals. To indicate the difference, numbers may be preceded by the number sign (dots 3456). Since in French the letter w did not exist, it takes a strange position in the system. Letters d till j also indicate the musical notenames CDEFGAB. Music always starts with an octave sign (combinations of dots 4, 5 and/or 6). Note values are indicated by dots 3 and 6. Absence of 3 and 6 indicates the eighth note. In Gregorian chant dots 3 and 6 are used to indicate neumatic forms. It was Louis Braille himself who devised a system for text, music AND chant. A facsimile of his 1829 paper can be found here. The introduction of the braille bar made eight-point braille more common. Dots 7 and 8 are mainly used for lay-out and context. Since all braille signs have several meanings, for the reproduction of braille it is important to use the right settings. The Standard Braille Order above enables you to check your settings. 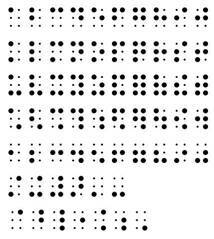 The image above shows the corresponding braille signs in Standard Braille Order. These braille signs become visible when you select the SimBraille font, that you can download here. Between 1934 and 1940 at the Electric Braille Press St. Henricus in Grave the Graduale Romanum has been printed in 15 volumes double sided Braille (2066 pages). Below you can find the digital files. First you see the most common special textsigns for Dutch and Latin, then follow the seperate chants of volume 15 and then the table of contents for all volumes with links to the digital braille files. The most important mistake that still may be found in these files is that somtimes one dot was missed or added. This way an r without dot 1 becomes a 6, and an o with dot 2 becomes a r.
Gregorian chant with liturgical text, taken from the Vatican edition and rythmed by the reverend benedictines of Solesmes. 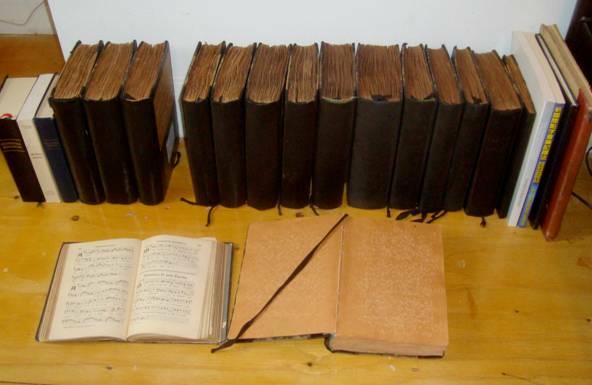 Geert Maessen, Transcription of Gregorian Chant in Braille (Amsterdam 2002), gives a summary of existing methods for transcribing Gregorian chant into braille and an alternative to process the achievements of the semiological movement into braille. The booklet can be ordered in braille at Dedicon (two braille volumes and one volume with tactile graphics). From the 2nd till the 4th of October 2002 in Marburg an international workshop was held about Gregorian chant and braille, in search for a standard to transcribe chant into braille. The participants were: Ulrich Mayer-Uhma (Germany), Bettye Krolick (USA), Bernard Morin (France), Christian Waldvogel and Lia Cariboni (Switzerland), Claire Gailans and John Armstrong (United Kingdom) and Geert Maessen (the Netherlands). Maessen's booklet was one of the pieces to discuss. Although on some points there were different opinions, the booklet has been launched as the standard for transcribing chant into braille. At the international conference on braillemusic from the 23rd till the 25th of September 2004 in Zürich this was once more confirmed, although for simpler liturgical chants an alternative was presented by Barbara Williams from Melbourne. Based on the dutch text of Transcription of Gregorian Chant in Braille in 2001 Dedicon transcribed five Gregorian masses: Christmas, Easter, Ascension, Pentecost and the Requiem, consisting of the proper chants according to Graduale and Offertoriale Triplex, with all associated verses. Vijf Gregoriaanse Missen can be ordered in braille (nine vomules) at Dedicon. For the contents of Vijf Gregoriaanse Missen see: Preface and Contents.